I am honored to return to Australia as a Featured International Artist in the Evolve Gallery at Rainbow Serpent Festival! It has been 6 years since my last art tour down under and I am dearly excited to reconnect with the beautiful Aussie community and world tribe gathering there this year! Hope you can join us in Australia for this year’s exceptional lineup of visionary artists, musicians and workshops! Returning to the Treehouse in ReIncarnation Village for both weekends, Morgan Mandala, Randal Roberts, Sweet Melis and I will be working on another large mural collaboration in the Forest to inspire your creativity, open your minds and enchant your heart. Come say hi! It is with great honor and delight that I will be returning for my SIXTH consecutive Rootwire Festival. It is always a highlight of my summer to return to the sweet rolling hills of Ohio each year to connect with the beautiful Rootwire family. I will be displaying my artwork in the visionary gallery and live painting throughout the weekend. Hope to see you in the heARTland at Rootwire this summer! Join us for an immersive art and musical experience featuring the artwork of some of Colorado's most inspirational artists. It brings me great excitement to return to the Rockies to display my artwork for this event and to live paint with our visionary family. Hope to see you there for this beautiful evening in Denver, hosted by 7Healing Stars and Potent Productions in alignment with Luminous Flux Gallery. My heART is simply elated to return to the Chapel of Sacred Mirrors (CoSM) for my second artist residency this March. I will be continuing my work on the Mushroom Cafe Mural and live painting for the Full Moon Gathering on March 3rd. If you are in the area, please come join us under the glow of the full moon, or visit the CoSM gallery the first week of March to say hello while I am painting in the cafe! I am honored to travel to the heart of ancient Mayan lands for Cosmic Convergence Festival! I will be live painting and displaying my artwork in the Cosmic Convergence gallery. It is a great joy to unite with our global tribe in the spirit of art, music and community as we come together to celebrate and share our unique expressions. Un sueno por el futuro ancetral! I am excited to return back to my roots for my 5th year as a live performance painter at Rootwire. I will be featuring a new collection of my artwork in the Rootwire Art Gallery and painting throughout the weekend. 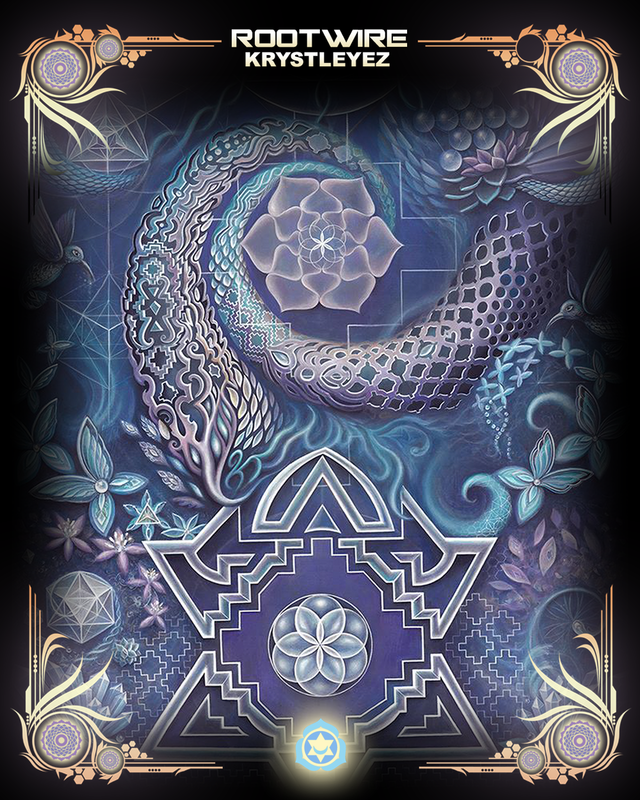 I will also be teaching a workshop on Friday afternoon, "Sacred Geometry: Connecting the Dots" where I will guide the audience on an evolutionary journey through the Flower of Life. Hope to see you there! It's exciting to return for my 5th Electric Forest. I will be working on a large scale painting collaboration located in the heArt of the Forest @ ReIncarnation Village with Morgan Mandala, Randal Roberts and Sweet Melis. Hope to see you there! I am deeply honored to be invited to spend a three week artist in residency at CoSM~ an artist sanctuary created by Alex & Allyson Grey devoted to connecting to the divine creative spirit within. During my residency, I will be contributing my heArt & vision to the Mushroom Cafe Mural. This mural was first started in 2012 by Jones Jonez and includes the artwork of 21 world renowned visionary artists including Alex & Allyson Grey, Mark Henson, Amanda Sage, Aloria Weaver and David Heskin, Morgan Mandala & Randal Roberts, Xavi, Chris Dyer, Jonathan Solter, Maura Holden, Michael Divine and Adam Scott Miller. Earth Night Live Visual Orchestra featuring Randal Roberts, Morgan Mandala, Sweet Melis and Krystleyez. Music by Papadosio with Special Guests: Wildlight (acoustic) & Tnertle w/ Lily Fangz). Joining together many facets of commUnity to offer healing, inspiration and growth, Arise Music Festival is an amazing Colorado festival destination. I am so excited to return to this beautiful event set into the gorgeous foothills of the Rocky Mountains in Loveland, Colorado. This year I will be offering a Sacred Art Temple in a Mongolian-style yurt which will feature a micro-gallery of my artwork. The Art Temple will be located next to the Lotus Temple and Solutions Village. Live painting alongside many of Colorado's finest visionary artists & musicians, I will also be working on a collaborative painting with Morgan Mandala & Randal Roberts. I am honored to return to Ohio this summer for Rootwire Transformational Arts Festival! This will be my fourth year as a featured artist, amongst a vibrant array of creative offerings at the festival. I will be live painting throughout the weekend and teaching a workshop titled "Sacred Geometry: Connecting the Dots." Join us for a transformational weekend of art, music, workshops & ceremony. You can also explore more about my live painting experiences in an article that I wrote for SolPurpose in 2013: "Rootwire: Through the Lens of a Visionary Artist". Grateful for the opportunity to paint onstage for InfraSound NYE 2016 at the Loft in Minneapolis, Minnesota! It was a gorgeous way to celebrate a New Year with a fresh canvas, potent visual/auditory alchemy and an incredible amount of love & support! Many thanks to Infrasound Productions, Fractal Visions and the Twin Cities Tribe! "Electric Forest Music and Arts Festival"
"Arise Music and Arts Festival"
"Gratifly Music and Arts Festival"
"Solo Exhibition @ Knew Conscious Gallery"
"Area 51 Presents: Visionary Arts Fair"
"CAVA (Colorado Alliance of Visionary Artists) Group Show"
"2013 Australian Visionary Art Tour"
It was a great honor to embark upon my first international art tour in the land of OZ!!!! "Rootwire Music and Arts Festival"
"Moksha Art Fair @ Art Basel"
"Ancient Civilizations and Alien Technology"
"Lightning in a Bottle Music Festival"
Live Painting for Lightning in a Paint Can. Visionary Collaboration with the 99 High Art Collective. "Beloved Sacred Arts & Music Festival"